The Maggie is available in various sizes containing 1, 3, 6, 10 or 20 rods per pod. IMATECH'S Zero Gravity Filters Maggie product line is an industrial range of fully automatic, in-line self-cleaning magnetic separation systems, which remove particles down to 1µ and are scalable to any flowrate, due to its modular design. The Maggie filtration system offers efficient, consistent filtration combined with very low maintenance requirements and is suitable for a wide range of applications in the metalworking and steel manufacturing industries such as engine washers, parts washers, grinding machines, honing machines and general machining installations. 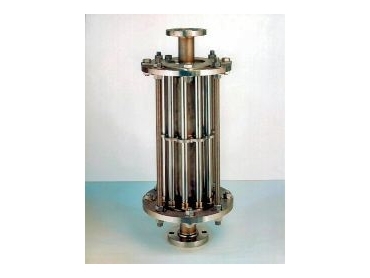 The key component in Maggie filtration systems is a thin-walled stainless steel tube containing seven rare earth magnet/pole combinations, each of which generates 9,000 Gauss on the tube's surface. While in separation mode, the particles are held to the outside of the magnetic tube, below the separator plate. Particles are allowed to accumulate on the outside of the tube - tests have shown that debris can increase to 0.5" thick. Purging the Maggie is based on time and requires no mechanical moving parts. Fitted on the outlet of the separator are two butterfly valves controlled by a single actuator. During purge, the discharge valve will close while simultaneously opening the purge valve. The magnets are then shuttled within the tube, above the separator plate. Flow from the top of the separator flushes debris to waste. The Maggie magnetic separator has minimal moving parts because of the simplicity of design, resulting in very low maintenance and operating costs. The Maggie is available in various sizes containing 1, 3, 6, 10 or 20 rods per pod. Multiple units can be combined to deliver greater filtration capacity. The modular, automatic Maggie magnetic separation system provides an autonomous filtration solution for uninterrupted, 24/7 filtration in a compact package.